Summary: Learn how to build a garden shed, construct the shed, fit the roofing felt, fit the shed windows and patch felt. Garden sheds come in a wide range of sizes so choose a size that will be big enough to meet your current and future needs. Even fairly small sheds come in large sections, so it is advisable to recruit some help before you start to put it together. Jolly Cabins supply garden sheds, log cabins, garages, workshops and other wooden buildings. Based in Essex, but delivery is free to most of the UK. The shed needs to be constructed on firm, level ground. If there is not an area suitable in your garden you will have to lay a concrete base. To find out how do this refer to the project laying concrete outdoors. Remember that a concrete base for a shed should be slightly smaller than the base of the shed to allow the rainwater to run off into the surrounding ground. Another option is to dry lay slabs on a bed of sand. But the slabs must be level so the shed will sit square on its base. With the slabs in place lay timber fence posts at intervals of no more than 750mm (2ft 6in) apart and at right angles to the bearers on the shed floor. Most garden shed kits come with the timber already treated, but if this is not the case apply wood preservative to the timber and allow to dry. Position the shed base square on the concrete or slab base. Lift the gable end into position so that the panel overhangs the base slightly and prop it up with a post hammered into the ground. Position the side panel and screw it to the gable end at the top, middle and bottom of each side of the joint. Attach the other sides of the shed in the same way. The bottom edge of the four walls should sit on the shed base with a slight overlap. Larger shed kits will include a roof beam. If this is the case fix it in position between the two gable ends. This will also help to make the structure sturdier. Hang the door in the opening. If the door does not open and close easily, the structure may not be square and the wall panels may need readjusting. Use a try square to check the corners are square. To square up the structure loosen the roof beam and knock the corners with a hammer. 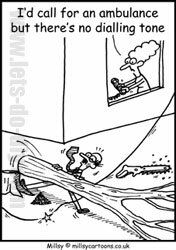 Remember to use an offcut of wood to protect the timber panels. When the structure is square, lift the roof panels and fix them to the roof beam, if your shed has one. Fix the roof securely in place by screwing the panels to the gable ends and the sides. Nail the structure to the shed floor. The roof needs to be covered with roofing felt and this will be supplied with the shed kit. Cut the supplied felt into three equal sections. A section each for the sloping panels of the roof and one to cover the apex and overlap the other two sections. Starting on one of the sloping panels lay the section of felt on the roof with its bottom edge overlapping the sloping panel roof panel by 75mm (3in). At the gable ends the felt should overlap by 50mm (2in). 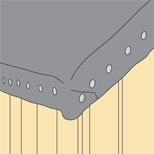 Fix the roofing felt in place using galvanised clout nails at 300mm (12in) intervals along its top edge. At the gable ends and along the fascia the nails should be at 100mm (4in) intervals. Fix the second section of roofing felt on the other sloping roof panel. Lay the third piece of felt over the apex of the roof overhanging both sides and smooth the felt out with a batten. Secure this final section of felt in place. Fold the felt at the corners into a triangle and fold the triangle back on itself and nail it down. If your kit comes with decorative gable fillets and corner trims, fix these in place as per the manufacturer's instructions. The sliding bolt or hasp and staple can now be fitted to the door. Fold the felt at the corners into a triangle then fold the triangle back on itself and nail it down. Garden sheds often have windows. Nowadays these are generally perspex and simple to fit. To fit the windows work from the outside of the shed. The window kit will have plastic or metal sills, which should be put in place and secured by wooden strips called cloaks nailed to the frame using small panel pins. From inside the shed, slide the sheets of perspex into the frame and secure them with beading nailed around the perimeter of the window. Once again use small panel pins. To ensure your shed lasts, it needs to be protected against the weather. Therefore treat it with wood preserver every year. Small areas of roof felt can sometimes get torn and will need repairing. Square off the damaged felt and measure the area. Add 75mm (3in) to all dimensions and cut out a piece of felt to this size. Draw a chalk line marking off 75mm (3in) all around the felt square and apply adhesive up to this line. When the adhesive is tacky - after about 30 minutes - lay the felt in position and smooth it out with a batten. 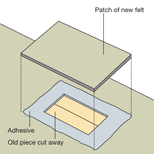 For repairs to larger areas, fix the felt with galvanised nails as well. The patch of felt should be 75mm wider all around than the damaged piece.